Au Bon Climat is a French term for “a well exposed vineyard site”. Being that the winery is situated in one of the preeminent vineyards in Santa Barbara County – The Bien Nacido Vineyard – the name certainly fits. It is the brain child of master winemaker Jim Clendenen. The winery was founded in 1982. The Central Coast which is now well known as one of the premiere wine growing regions in the country was in its fledgling stage. By 1989 Robert Parker, whom at that time was the dominant voice in the US wine industry, had identified ABC (as the initiated refer to it) as one of the “Best Wineries in the World”. A significant achievement for a winery only seven years old! The focus at Au Bon Climat is the production of well balanced Chardonnay and Pinot Noir, with a clear nod to the great wines of the Burgundy region of France. Jim does own two vineyards, one at the southern end of the Santa Maria Valley called Le Bon Climat, as well as Rancho La Cuna located in Los Alamos, but he also sources grapes from many of the most historically significant vineyards in all of Santa Barbara County: Bien Nacido, Sierra Madre, Neilson, Sanford & Benedict, and Los Alamos, as well as many from outside the county: Talley Rincon (San Luis Obispo), Elke (Anderson Valley), and Barham-Mendelsohn (Russian River). Jim also produces a profound wine which emulates the original Corton Charlemagne cepage planted around 800 AD. After extensive research in France, tracing lore and legend, Jim discovered that the original plot had no Chardonnay planted at all! It was a blend made from the Burgundy clone of Pinot Gris called Pinot Buerrot, Pinot Blanc, and a bit of Aligote. The legend that surrounds this historic vineyard site is recaptured on the back label of what is Jim’s favorite white wine, Hildegard. It is named for King Charlemagne’s patient but ultimately intolerant wife. The King loved to party, and the parties lasted days. The local wine was Pinot Noir, and left quite a mess after Charlie’s bacchanalian soirees. In an effort to appease his beautiful bride he ripped out some of the vines from one of his best vineyards (Corton) and planted the above mentioned white grapes in their place. Much less messy. Party on. 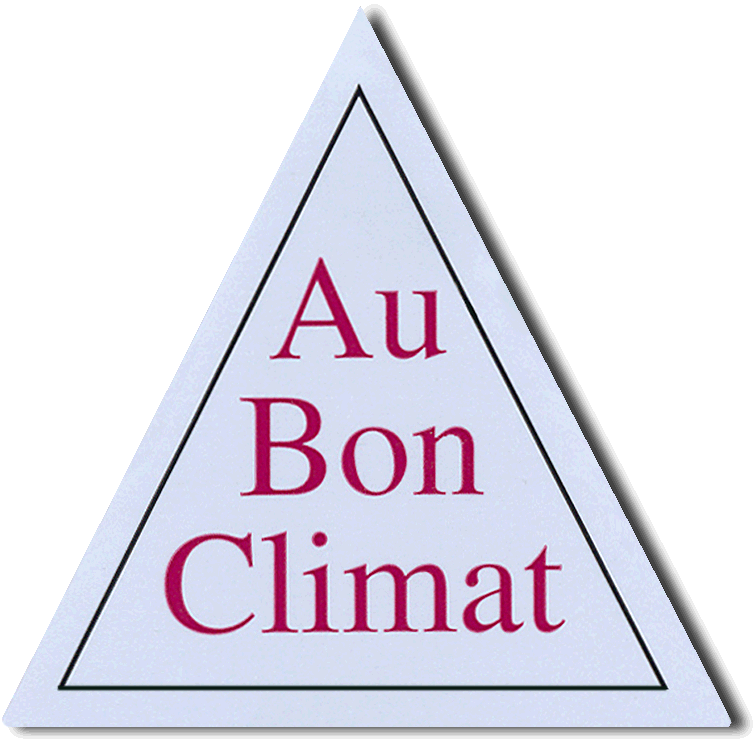 Au Bon Climat makes about 22 wines under this unique triangular label. Jim however, never met a grape he didn’t want to ferment, so he has spawned numerous other labels over the years to accommodate his various projects. 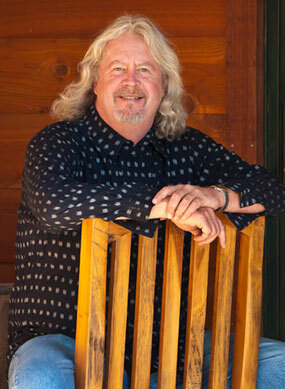 Presently, he has consolidated most of these projects under the Clendenen Family Vineyards label, though he also makes a small amount of Chardonnay and Pinot Noir under the Ici La Bas label sourced from Oregon and the Anderson Valley. The winery is located smack in the middle of the dramatically landscaped Bien Nacido Vineyard on the outskirts of Santa Maria. It is not open to the public, however they do welcome visitors from the wine trade by invitation only. Jim graduated from UC Santa Barbara with honors in a Pre-Law program in 1976. And no doubt Jim would have won many arguments throughout what would have surely been an illustrious career in the courtroom, but his path took an unexpected turn while visiting France during his “junior year abroad” in 1974. He discovered that there was a life beyond tacos and beer. Upon graduation, he rewarded himself with a one month stay in Burgundy and Champagne which sealed the deal on his fate to become one of the pioneers of the Central Coast fine wine world. After a quick initiation stint as a “cellar rat” voraciously learning everything he could about the process of wine making from dirt to barrels, beginning with the 1978 harvest Jim stepped in as the Assistant Winemaker at Zaca Mesa Winery – one of the first estate wineries established in Santa Barbara County. Jim being a firm believer at the time that anything worth doing is worth doing to excess, in 1981 he found a way to work 3 harvests in one year – directing the crush at wineries in Australia and France as well as on his home turf. This masochistic feat convinced him he was ready to start his own winery. He launched Au Bon Climat the following year. He began working with his now ex-partner Adam Tolmach in a leased space. He quickly cultivated a reputation for making some of the best Burgundian-style Chardonnay and Pinot Noir in the country. He also made delicious Pinot Blanc and Pinot Gris. By 1989 Robert Parker included Au Bon Climat on his “short list” of Best Wineries in the World. The honors and accolades have kept coming ever since. In 1991 Oz Clark selected Jim as one of 50 world-wide Creators of Modern Classic Wines. The Los Angeles Times selected him as “Winemaker of the Year” in 1992. Food & Wine Magazine selected Jim as “Winemaker of the Year” in 2001. The leading wine publication in Germany Wein Gourmet named Jim “Winemaker of the World” in 2004. And in 2007 Jim was inducted into the James Beard Foundation’s “Who’s Who of Food & Beverage in America”. To this day, rarely a year goes by that Jim is not quoted in either a wine or mainstream publication as a sage sharing his passionate philosophy of producing balanced wines that are compatible with food. A style that has fallen in and out of favor over his 35 years of wine making, but never once did he consider veering from his course.